Create your own Windows Cloud VPS server in just a few moments and prepare you business for tomorrow's challenges! Trustworthy Windows cloud VPS solutions in MyDataKnox. data center in the region (EU) provide quick, stable and immensely reliable performance of the VPS servers. The Windows cloud VPS series is powered by Xeon processors of the newer generation. All options are fully configurable and enable you a choice of up to 8 CPU cores and 16GB of RAM (more available on demand), while excellent enterprise hardware and one of the best data centers in the region provide for quick, stable and immensely reliable performance of the VPS server. MyDataknox Cloud VPS servers will fulfil the needs of most users, whether they are private individuals or companies. Cloud Windows FAST VPS series, just as Cloud Windows VPS, uses enterprise flash storage for data storing, but the FAST VPS also uses an implemented SSD caching system for extra acceleration. MyDataknox Cloud FAST VPS servers, by decreasing the I/O delay, provide carefree work using complex applications that require a more intensive type of work with data on the disk. In case you have the need for more public IP addresses, along with each VPS, you can hire up to 4 additional IPv4 addresses. MyDataknox Premium support offers you a complete solution for issues with VPS servers. The Premium support is an ideal service for those users that want a more serious approach to maintaining servers or for users that do not have technicians that will maintain the server. With Premium support, simply contact our technicians with a request and the necessary work will be done in the shortest time possible. Our support is available 24/7/365. For more detail regarding premium support, read the Terms of support. Cloud backup is a service that enables you to periodically save data on a high quality central server located in our datacenter. MyDataknox protects your data by replication and synchronization via a network, saving so called „snapshots“ of every modification, which ensures that your OS, applications, files and data are simply saved and can be brought back from a protected copy, especially in the case of a catastrophe. Through the MyDataknox control panel, you can control your VPS server in detail. It enables you to start-up, stop and restart your server, to establish a VNC connection through a browser, change passwords, install an OS, and much more. 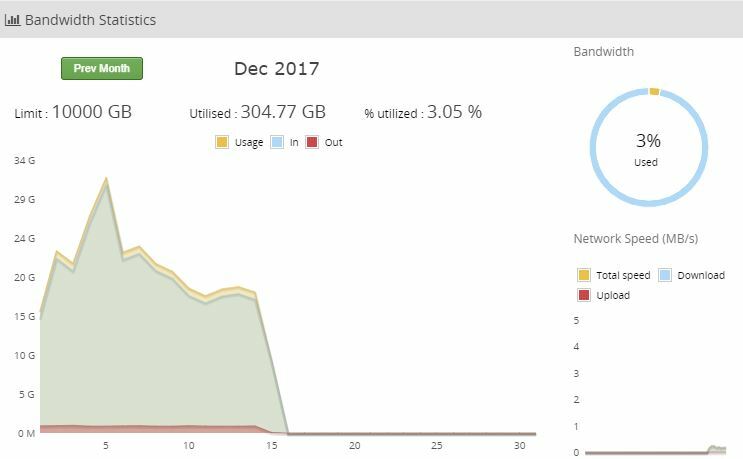 Bandwidth statistics enables you to quickly review the amount of transferred data for the current month, or previous months. Even though MyDataknox VPS servers do not have a traffic limitation, it is very useful to track the state of the server and the time when the most traffic is being used. Simply monitor all important aspects of the server. 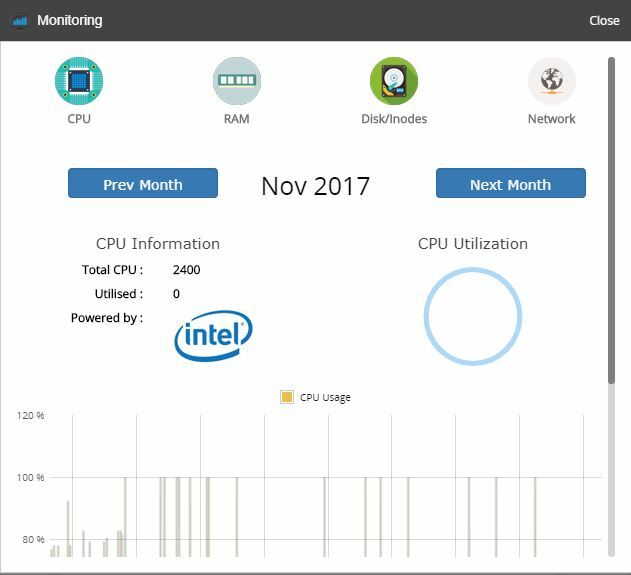 The monitoring interface enables you a quick and detailed insight into the usability of the CPU cores, memory, disks and network. Graphs can be zoomed-in for a more precise view. Contact our support, we'll gladly answer your questions. Do you have questions about VPS services? We offer you quick answers to the most common questions. HOW DO I ACCESS YOUR CLOUD VPS SERVICE? Depending on the type of server, you will have Remote Desktop (Windows) or SSH access to the server (Linux). Likewise, you can control the server through the control panel within the Mydataknox user interface. HOW CAN I PAY FOR CLOUD VPS? You can pay Mydataknox cloud VPS online (by cards and PayPal) or directly to the bank account. You can choose monthly, quarterly, semi-annual or yearly payments when ordering.  IS THERE A VPS BACKUP OPTION? Mydataknox offers an R1Soft Cloud Backup service that allows you to backup up to 2 full servers in a separate cloud. You can find out more about this service here. WHAT IS INSTALLED TO MY SERVER? All servers come with the selected operating system, no additional software. All applications and services such as databases, firewalls, web servers and the like are installed on your own, according to your own needs. ARE THE DISCS SATA OR SSD? Cloud VPS service is running on the Mydataknox cloud and neither SATA nor SSD drives are used. We use high quality enterprise flash storage to save data. WHAT IF MY NEEDS OUTGROW VPS? Mydataknox Cloud VPS service is scalable and you can easily request resource upgrades. If your needs outgrow VPS capabilities, you can check our offer of dedicated servers. If you want to test the speed of data download with the Cloud VPS server, we have prepared a 100MB download file for testing. Keep in mind that the results may depend on your internet provider and any limitations on your network.